Our Church has a rich tradition of welcoming the stranger, aiding the afflicted and supporting the immigrant. This tradition is rooted in the biblical vision of love of strangers. Jesus reiterates the love that we are to have for the stranger and tells us that it is a criterion by which we wil l be judged (Matthew 25:35). St. Paul reminds us that we are one in Christ (Galatians 3:28) and that we all share the dignity of the children of God. Our nation is presently engaged in a debate on immigration policy that is causing deep divisions among our people and is causing anxiety among the aliens who reside with us. Balancing the right of all people to migrate to sustain one’s life and family with the rights of nations to regulate their borders and to set immigration policy is not easy. A fair resolution will only come through the application of justice and mercy. Recognizing that participants on both sides of this national debate are acting for the common good and are motivated by justice and compassion, we must respectfully speak up for the rights of the immigrants and those on the margins. Unfortunately, we do not live in an ideal world. Poverty, war and misery cause many to resettle in another country. While people have the right to move, no country is obliged to receive so many immigrants that its security, societal or economic well-being is put at risk. Undocumented immigrants pose a special concern for us as Church and as a nation. Some regard undocumented immigrants as a threat to our security. As a church, we know that the rights and dignity of every person are not conditioned on a legal status. We are to love and to serve all people. So what are we to do here in the North Country? I propose three ways that we can responsibly participate in the current debate on immigration and offer support to our brothers and sisters who are in need. First, we must fight for a comprehensive reform of our immigration policy. Second, we have to support all refugees and immigrants and look after their needs. Lastly, we have to seek ways to heal our divisions and foster a constructive dialogue to resolve issues and calm fears. The American bishops are involved in discussions with the government officials about immigration reform and about the just treatment of refugees and immigrants. We can all support these discussions by writing to our elected officials encouraging them to work toward a solution to these complicated issues. Comprehensive immigration reform is the best solution to many of the challenges that immigrants and refugees are currently facing. As a Church, we must support the stranger who lives among us, i.e. immigrants and refugees who are our brothers and sisters. We may be approached by parishioners and others who are troubled or fearful as a result of the changing immigration policies and orders. We can offer support, spiritual guidance and compassion to those who come to us. 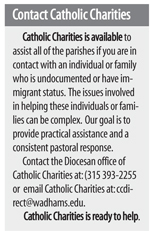 Under Department of Homeland Security directives, while not places of sanctuary, our parishes are “sensitive locations”, which means that persons seeking services from or participating in activities at our parishes may do so without fear or hesitation. We need to make it clear that the Catholic Church will support all who come to us, regardless of their immigration status. Our communities should welcome all who seek spiritual comfort in our parishes. We should extend to all whatever assistance is possible. We can offer meaningful help to those who approach us by providing assistance, support and guidance, while we work for immigration reform. Taking care of human needs is possible for us. We can educate our people in the plight of immigrants and refugees and ask them to support our brothers and sisters in need. 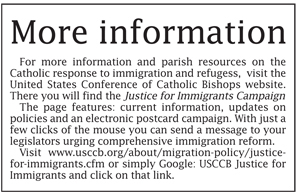 I have encouraged our priests to work with parishioners to find ways to make known the plight of undocumented persons in our area, and to devise ways that our diocese or parish community can assist undocumented persons. Remembering the needs of immigrants and refugees in our general intercessions and prayers is a sign of support. Offering knowledgeable speakers on the legal options of refugees and undocumented persons can give valuable guidance and information to our brothers and sisters in need.I invite our priests and parishioners to work together to find ways to extend a helping hand to the aliens living among us.